Two hands gently cradling a read heart present a powerful and contemporary symbol of love. The gold rings circling the heart speak of the covenant love represented in a marriage; love that endures trials and stands the test of time. 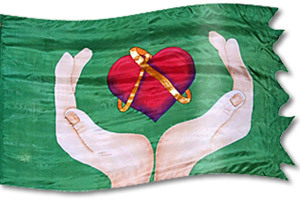 The large hands speak of God as the true source of love, while the red color of the heart represents atonement and the ultimate act of love in the sacrifice and shedding of Jesus’ blood. The God of Compassion desires that we walk in love with Him as well as in obedience to Him. To do this, we must grow the fruit of the Spirit in our lives as we ask His help to enable us to "love our neighbour as ourselves." The Lord is described as He who “keep(s) Your covenant (1 Kings 8:23, 2 Chronicles 6:14 and Nehemiah 1:5). We are told the Lord’s covenant, one of life and peace (Malachi 2:8), will stand firm (Psalm 89:28) and everlasting (Isaiah 61:8). Galatians 4:24 describes two covenants, the old and the new as promised in Jeremiah 31:31, with Christ’s shed blood forming the foundation of the new covenant (Matthew 26:28. Marriage is described as a covenant between a man and a woman (Proverbs 2:10, Malachi 2:14), one God is not happy to see broken (Malachi 2:15-16, Matthew 19:4-6). Gold: Everlasting God, God's Divinity, God's Glory (Exodus 37:6), Crowned King, The Power of the Resurrection Which Brings Healing (Revelation 3:18; 1 Peter 1:17; Ezekiel 1:4; 8:2).